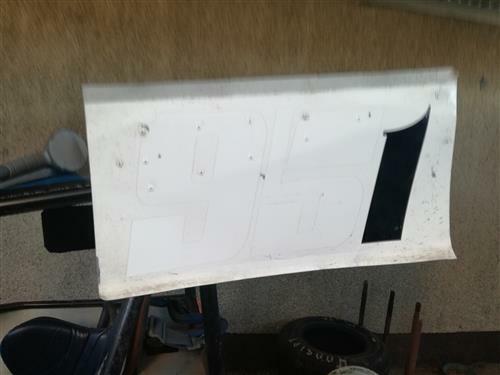 While a lot of Northern Irish Oval racing fans had made their way to Cowdenbeath I was making my Superstox debut at Aghadowey. It didn’t get off to the best of starts, quite literally when I stalled the car what seemed like a hundred times going out for practice, wearing out the starter and meaning Adrian had to spend the night charging the battery between races. I started off the back in all three races, only being lapped in the closing laps of the first heat by the top three in a race which included a stoppage. Heat two there was no stoppage but again I was lapped by the top three in the closing few laps. In the final I put the car in third gear instead of first, then found fourth while trying to get second and was already being lapped before finally getting the car into second, from then on I went backwards keeping out of the road and only on occasion got back onto the racing line and tried to stay with other cars as best I could. It wasn’t the final I’d hoped for, but for a first meeting my aim had been to finish all three races, not spin, not cause a stoppage and not cause damage to the car, I could tick all those boxes. It had been a great experience and I can’t think Adrian McKinstry enough for the opportunity, but it had definitely arrived at a crossroads between grass and tar…. and tar was winning. A week after my Superstox debut it was back to the grass, I’d already a B&B booked for doing the final round of the All Ireland Autograss Series at Mallow. I was still buzzing from my Superstox outing and at the time my frame of mind was to go out and show what the car could do amongst the best in Ireland in the class (nonsense I know, the best in Ireland race at Down and weren’t out!!). 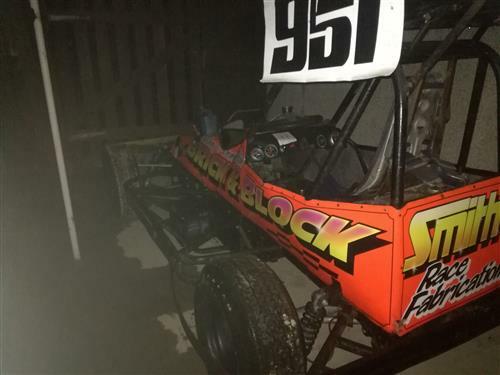 The idea would be to put the car in the shop window, get it sold and move on to Superstox, hopefully get some good results, take a trophy home and finish my Autograss career on a high. The car didn’t get the memo though, it drove down to the pits on the Friday night, drove through scrutineering and was parked up for the night in the pits. Saturday was the first day of racing and I wandered round chatting with people and awaiting my class going out, when the time came the car wouldn’t start, most of the Down members at the weekend were working on it at some stage. I eventually gave up after trying to get the car started ahead of the first heat, took my helmet and bits and pieces back to the car and hoped I could get the car from the pits during the break and load up and go home. 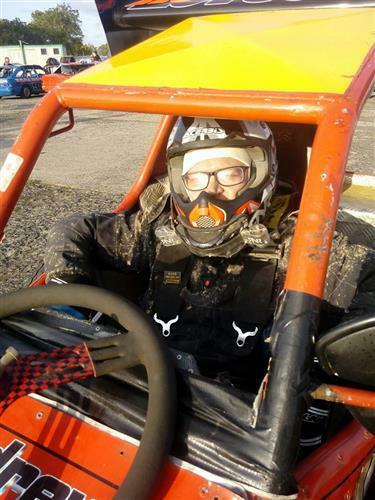 The car again had other ideas, it started, then started again and again between the heats, I went off got my helmet and safety gear and got ready for heat two, only for the car to die again when it was time to go and line up. This time it wasn’t for starting again, I watched the rest of the days racing, loaded the car up with the help of Darren Pearson and a few others to get it up quite a steep hill when you’re pushing a car on grass, then headed home on the Saturday night. 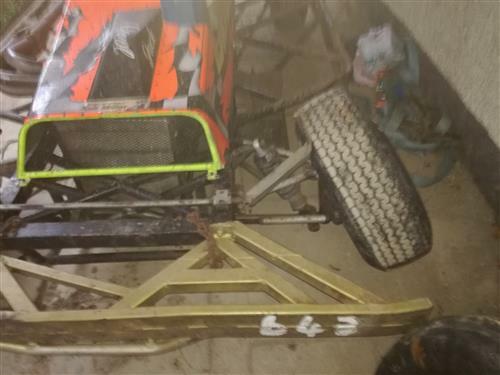 By the time the next Autograss meeting came round half the country had looked at my Buggy and it still wasn’t going, opinions varied from it being a fuel issue to an electrical issue or a fuel issue caused by an electrical issue. Heavy rain in the run up to the weekend of the 16th/17th of September which was now the 3rd advertised date for the King of Down weekend had meant it was cancelled. The cancellation was a blessing of kinds, during the week I’d picked up Jeff Minish’s Superstox and the Saturday night was going to be my second Superstox debut, this one being in my own car. In the run up to the meeting I had been considering how I could race the grass car on Saturday then the Superstox on Saturday night and back to the grass car on Sunday, but in the end it was a relief the grass was off and I could focus on the Superstox, besides anything else the grass car still wasn’t going. 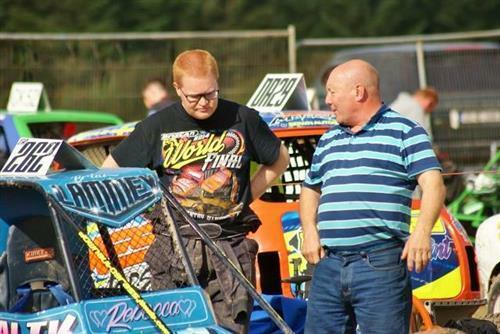 The 16th of September was a date earmarked by me from the start of the season as being the F1 World final, but as things turned out it became my first outing in my own Superstox, it was quite different from the arrive and drive experience of the previous outing. 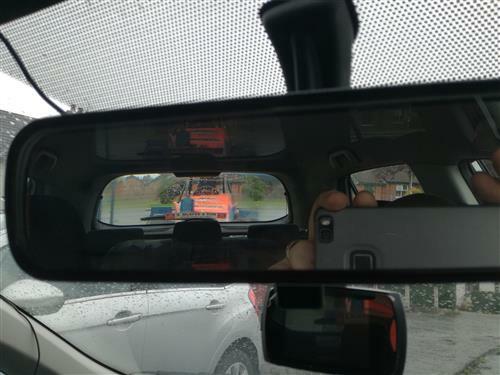 I spent the day looking over the car, taking measurements to refer back to and getting Gary Beggs to do a bit of welding on the car before I set off for Aghadowey, literally from I got up, had my breakfast and had a cup of coffee until I came home I was at the car. I was one of the first to arrive at Aghadowey and by the time I got through sorting tyres sheets and doing this and that I still managed to be one of the last out the gate to practice. It had been a wet day, the track was quite wet and my first few laps of practice didn’t instill too much confidence as I first spun on the exit of turn two and had to tip toe across the grass to get back onto the black stuff and then a few laps later gave it too much on the straight and dumped the car across the grass heading towards the pit bend. There was a point I thought I had made a huge mistake buying a Superstox and there was a point when I was willing the practice to end and I could get back out the pit gate. I put a few more cautious laps in and finished the session. I put my less than impressive practice session down to being the only car out on track, I’d no measure of how hard to push and I think I’d perhaps pushed too hard or at least too hard for my ability to drive the thing at the time. I put my spins down to experience and hoped I’d learnt from them, my aim for the next race was just to finish and not spin. The Superstox were the second race out, so I didn’t have much time to dwell on it anyway, a splash of fuel, a shock adjustment and a quick walk round the car to admire the familiar look of grass and muck over my race car and it was back into the seat and out of heat one. I started off the back and finished last but mid race had been catching Neil Davison and looking back on the times I set a faster lap than Cyril Hawe, who’d dropped his oil all over the track and made for an extremely slippy closing few laps. I may have been last, I may have been lapped from the leaders but it was more encouraging than my practice session had been. Heat two with the track drying I was still using Neil Davison as a measuring stick, but I was well off the pace and still managed to spin, perhaps I gave the drying conditions too much respect, perhaps I’d dropped too far back at the beginning and wasn’t pushing enough, I’m not sure. Following my spin I rejoined and put a few more laps in and finished. The final was my best race of the night, the track was drying, some carnage on front of me had put Greg Hyndman and Neil Davison squabbling for position on front of me and I was catching them for a few laps, I could already visualize my first pile up if it all went wrong if I caught them, but Neil spun before I could and now Greg wasn’t battling he was pulling away from me again. Unknown to me Neil rejoined and I pulled out of his way to let him past thinking he was the race leader coming round, but as Neil pulled over to let traffic through on the last lap I followed the leaders through and took the place back, I was only lapped by the top 3, I wasn’t last, I hadn’t spun and I had been catching cars in the middle of the race, it felt a long way from standing on the roof winning championships, but it felt like it was a huge step in the right direction. It was the point my mindset changed from “what have I done buying this?” to “I think I’m rather going to enjoy this”. The next outing should have been in the Autograss car, but the Saturday of the weekend I chose to go on a tractor run, and the Sunday was cancelled due to the weather, a running theme for the season. 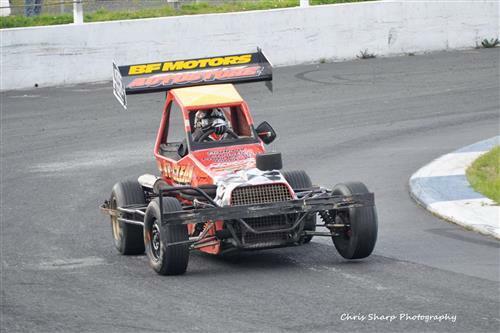 On to October then, the same weekend as I secured the NI Points title for my class in Autograss the previous year and it was time for the Superstox Irish. A week of wrestling with tyres led up to the big day. 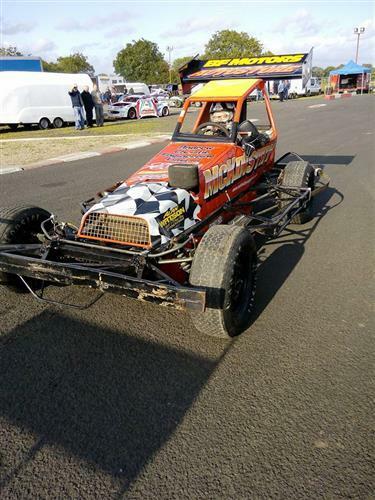 It used to take me an age to get the Autograss car ready to go racing and early signs with the Superstox tell me that trend will continue, but at least I know or hope it’ll get easier. Gary Beggs offered to tow me to the Irish on his van, the help is always welcome and it does no harm to have a former World Champion in your corner when you’ve no idea what you’re doing. A greasy track meant practice began with a spin. Keen to put that behind me we made a few changes and I went out again and kept it pointing the right way. The Irish began with me on the outside of the row from the back with no one behind me on the outside, I missed second when the flag dropped and lost half a straight on the cars on front before an early stoppage regrouped the pack. I took the restart in second and seemed to stay with the cars in front for a lap or two before dropping back from the pack, where I got steadily further away lap after lap until I spun with half a dozen laps left and spent the remainder of the race bogged in on the infield. Somehow between the previous meeting and the Irish meeting I’d got it into my head it was a good idea to take the revenge race from the front of the reversed Irish grid, that it would be time to step forward and take whatever was coming, somehow my mind hadn't recalibrated that I’d spun on two of the three excursions that night and perhaps while I’m still guessing settings it would be better to cruise around at the back, so I ended up starting the revenge race on pole. Forgetting everything I’d ever learnt about Stockcar racing I led a fairly quick rolling lap (as I was in second not wanting to miss a gear from the front) and waited and waited for the green, when it came I was already being pushed broadside towards the infield before getting caught up with Gary Grattan and going back out to the wall before coming to rest in turn one with the wheels locked together, getting free’d and then retreating to the infield with a fairly mangled front upright. 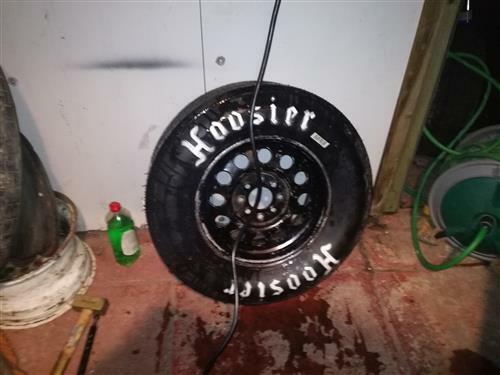 It was one of the shorter races I’ve taken part in, but I got hit, I got half spun, I went up the wall and wrecked a wheel, for 100 yds of track I’d put a lot of things you could fear behind me. 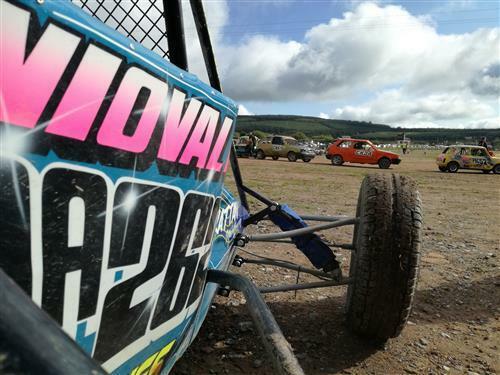 A week on from the Superstox Irish and it should have been back to Autograss, but that was cancelled again and the half an Autograss season that had taken place was now over. The AGM took place that weekend too and I stepped down as PRO, or didn’t re-stand, whether I’d even have been voted in, who knows. For now the PRO bit at least is a closed chapter and one less thing to be doing in 2018. The last Saturday in October was the NIOvalTV Series final at the Tullyroan Gala night, two weeks of doing a bit here and a bit there to get the front end of the Superstox back together and a few more evenings of swearing at tyres, the highlights of which included trying to take one off with a grinder, not recommended in a closed space, dropping a valve into a tyre and letting go of the valve on a tube only to have it blow back through the hole in the rim and leave me with a half inflated tyre I couldn’t get the valve out of or tyre back off to get at the tube. Some people go to the gym to keep fit for motorsport, I spend 2 nights in a tyre machine between each meeting! 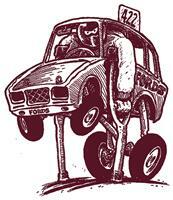 Like the previous Superstox outings I’d worked on the car from I had my breakfast until I had to go racing. It was a windy day and the nice wee blip up the motorway to Tullyroan was more like a white knuckle ride of watching the trailer try and overtake me on the way down the road, so I arrived at Tullyroan after the longest drive I’ve ever had to Tullyroan at a soul destroying speed. Once at Tullyroan I had a reasonably first practice, I hadn’t spun, that was progress. Then I’d another practice and the car felt good but I thought the outside back felt a bit soft so I adjusted that….. The wrong way and made it softer for heat 1. I led the whites away for heat one and made a poor start because I still haven’t sussed out how to stop my goggles steaming up on the rolling lap and didn’t see the flag, after only a few laps I put a wheel over the kerb and spun on turn 2, after a bit of back and forwarding I got turned round, rejoined and did a few more laps before getting hit by Aaron McNeilly, seeing the wall coming towards me and planting it to spin rather than go in the wall, that spin sent me onto the infield and another race was seen through bogged in on the grass. A few more adjustments made for heat two and it was time to go again. Coming off the back of the white grade I’d higher hopes I could sit with them and follow to learn a bit, but the fan blade had other ideas and disintegrated on the first lap, at the time all I knew was there was an almighty crack and something came around the front of the car, not know if that something was going to send me into the wall in turn one I went easy and let the field by before really trying to push on, as it happened there was a decent amount of Superstox out and letting the field by became spending most of the race on the outside, I’m not sure if I even got a full lap on the racing line to see how the car went, since my setup felt better this time but looking at mylaps I was nearly a full second slower than heat one on my best lap I kind of hope I didn’t get a good lap. As the race finished my car was getting a bit steamy and when I got it into the pits we found the fan belt was no longer there, the timing belt had a chunk out of it and the hose into the water pump was damaged. It was decided it was wiser to load up than break a timing belt and finish the year on any more of a low. The Superstox is rapidly following the trend of the grass car and just being an endless cycle of work, race, disappointment, really looking back the highlight of my 2017 season was a meeting in a car I’d a loan of, it probably doesn’t get any easier than arriving at a track and setting your arse in a car, driving it round and giving it back, if you ever get that opportunity I recommend you don’t pass it up! Thanks as ever to my sponsors and everyone who helped me out throughout 2017, of which there are probably too many to list, but they each know how they are and in some cases such as Mallow I don’t even know how many people or half the people who tried to get me out on track as I was sat strapped into the car, either way I’m grateful for their assistance, without them I wouldn’t have got this far.